Even with all the modern wood finishes available, oil base varnish is still popular and a favorite of professionals and “do-it-yourselfers”. I like it for many reasons. The main reason is it will stick to almost any finish. Plus, it has excellent resistance against abrasion, solvents, water and the damaging effects of the sun. The best reason for considering a quality oil base varnish is its ability to adhere to most clear wood finishes. This is a great feature when refinishing interior trim or maintaining an exterior door. Very few other clear wood finishes can adhere to lacquer, polyurethane, acrylic urethane and catalyzed finishes. Not all wood finishes are compatible with each other. Problems can occur if a wrong product is applied over an old existing wood finish. The rules are very straight forward and easy to understand. Lacquer and catalyzed finishes have very strong, hot, solvents. These solvents will degrade other finishes, such as polyurethane and acrylic urethane. The effect usually appears as a multitude of fine cracks or bubbles. “Hot” fast drying finishes can be applied over themselves only. Not over slow drying finishes. Polyurethane, often called polyurethane varnish, is best suited for new projects and should be applied over itself only. Although great advances with its compatibility have been made, I still recommend poly over poly only. 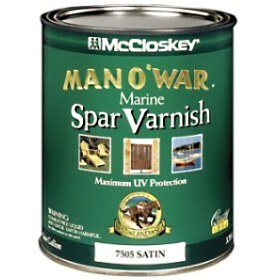 A true oil base wood varnish, such as marine spar varnish, has great adhesion properties. This includes lacquer, catalyzed finishes, polyurethane, acrylic urethane and most other wood finishes. Most clear wood finishes impart an amber color to the wood when applied. This mostly applies to oil base finishes. The amount of amber color is very minor and adds to the richness of the stained or unstained wood. The amber color is slightly intensified with additional coats. Sheen choices are satin, semi-gloss and full gloss. The actual sheen depends on the manufacture. My experience is that oil base varnish is shinier than paints with the same sheen. An example is that satin is more like a semi-gloss and semi-gloss is similar to gloss. The sheen level or intensity will not increase with additional coats. Test the sheen before application if the gloss level is very important. Choosing an appropriate oil base wood varnish for your project depends on whether it is an interior or exterior project and the environmental conditions the finish will have to endure. All varnishes have the same basic ingredients; curing oils, resins, solvents and metallic driers. Curing oils can be Tung oil, Linseed oil or cheaper synthetic oils. Traditionally Linseed oil and Tung oil was used, but the cheaper synthetic oils have become prevalent in the market. Resins can be derived from natural or synthetic sources. Some manufactures use polyurethane as the binding resin. There are several types that can be used in different combinations. Each manufacture has their own formula. The one part oil base finishes use mineral spirits as the main solvent. The solvent provides workability with a brush. In the past lead was used as the metallic dryer. Today, healthier metals are used. The dryers speed up the curing of the film. Additional dryers can be purchased and added if the temperature is cool or the humidity is high. These are called Japan Dryers and can be purchased at the paint store. Not for use with synthetic finishes, such as polyurethane. The only difference between interior and exterior products is the ratio of curing oil to resin. More oil produces more flexibility, but the film will be softer. Flexibility is needed for exterior projects that are subject to temperature extremes of hot and cold. More resin produces a harder film and is best used indoors. Both the interior and exterior products can be used interchangeably. For the best result with an exterior project use an exterior rated product. Spar varnish is the best choice for exterior use and is a combination of Tung oil, Phenolic resins, solvents, dryers and additional UV blockers. Although this wood finish has many great characteristics and is suitable for many interior or exterior wood surfaces, it does have its drawbacks. Slow Drying – Typical drying time between coats is 24 hours. The film will tack-up faster with the addition of Japan Dryers, but still needs overnight before it can be lightly sanded and recoated. This inability to dry quickly can produce problems with dust adhering to the film. Try to work in a dust free environment. Difficult to apply. – Typical application is with a soft white bristle brush. Using an airless sprayer is almost impossible, even with a fine finish spray tip. An HVLP can be used, but still requires some finesse. Requires multiple thin coats. – This is a result of its drying characteristics. If a coat is to thick it will cause runs or sags. Keep an eye on the newly applied coat and catch any runs as they occur. I use oil base varnish for small projects or if I don’t know what the original finish is. This includes exterior doors and stained windows or interior wood trim being refurbished. I prefer a satin spar varnish for most projects. For large amounts of new wood requiring a clear finish I use different products that dry fast and still offer excellent protection. Oil base wood varnish isn’t suitable for food contact surfaces, countertops or wood cutting boards. Plus it can’t be applied over green, wet or sappy wood. Wood window sashes, interior and exterior. Wood trim; base, casing and window sills. Wood furniture such as tables, chairs, etc. Over paint for a protective clear finish.